In every company, various incidents such as accidents or altercations are bound to happen. And every time that these problems occur, management would need to gather as much information as they can from the people involved in the incidents. That is when witness statement forms are used to write down all the details people can recall about the incident they happened to see. 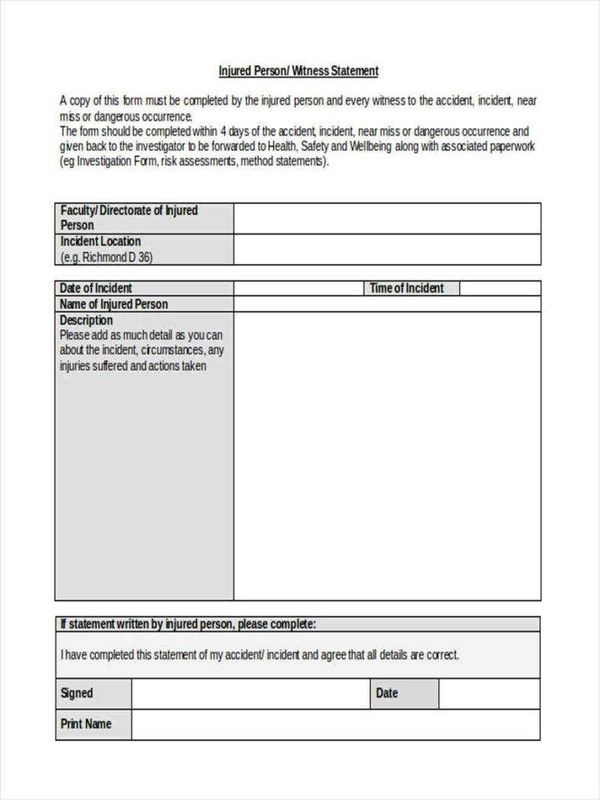 Here are some useful tips and statement templates that you can use should you ever need to document an incident in your company. A witness statement is a document that sets out what a witness says about a particular case. 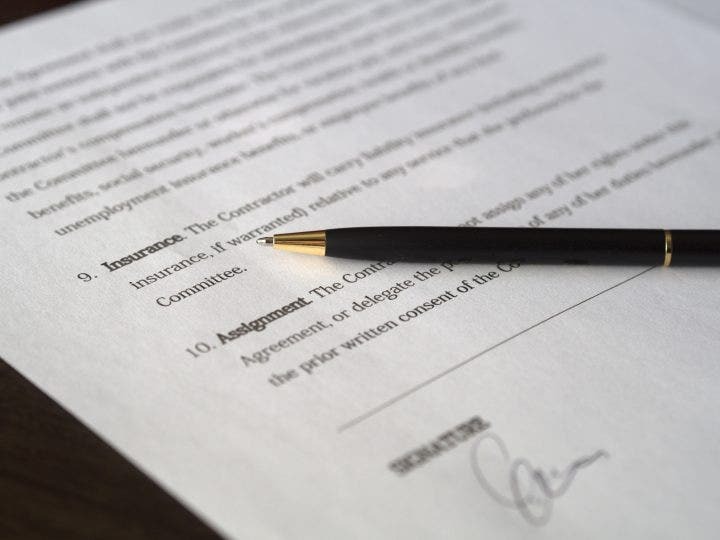 So if you want to bring a witness into arbitration, you must file and serve a witness statement by the deadline in the directions set down by the Fair Work Commission. If you do not file a witness statement in time, then the commission might not let the witness present it as evidence. You will need to prepare a witness statement for yourself and get one from every other witness. Be on one side of an A4 paper and has to be either typed or neatly written. Start with yours or the witness’ full name, address, and occupation. Make sure to include anything that you or the other witness were able to hear and see. Do not put anything that is just based on gossip as these will not be able to add anything to the statement. You will need to prepare a witness statement for yourself and get one from each of the other witnesses. You have to remind them whatever information that they put in can and will be used against them. This will make sure that they understand the consequences should they decide to include any information that is not factual. If you want to refer to a date but you are not entirely sure when a certain incident happened, you can give a date range or say “on or about” a date. This is only if you cannot give an exact date of when the incident occurred. If you want to write down what somebody said to you or things that you told someone else, then you should put whatever you want in quotation marks. If you cannot remember the precise words that were said, then you can always put in the words “he said words to the effect” then the statement with the quotation marks. 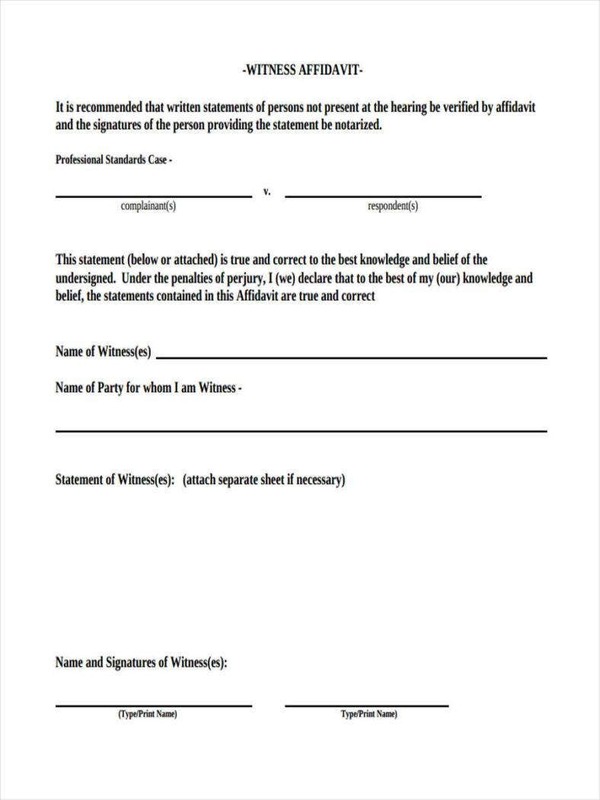 If you are going to bring up a document in a witness statement, then you have to make sure that you attach a copy of the document at the end of the statement template form. These documents are called “attachments” from then on. You should label the top of the first page of each attachment with a sample letter. For example, the first page of the first attachment should be labeled “A”, then the first page of the second attachment should be labeled “B”, etc. Have the witness confine comments to what that person was able to witness with his or her own eyes. Avoid recording hearsay or any particular statements that are not within the witness’ personal knowledge. Make sure to use quotation marks whenever you write down whatever the witness actually says he or she saw. In addition, you can introduce the witness’ quotes by making use of language like “the witness stated”. In the event that the witness says that another person described the incident to him or her, record the name and contact information list of that other person immediately. 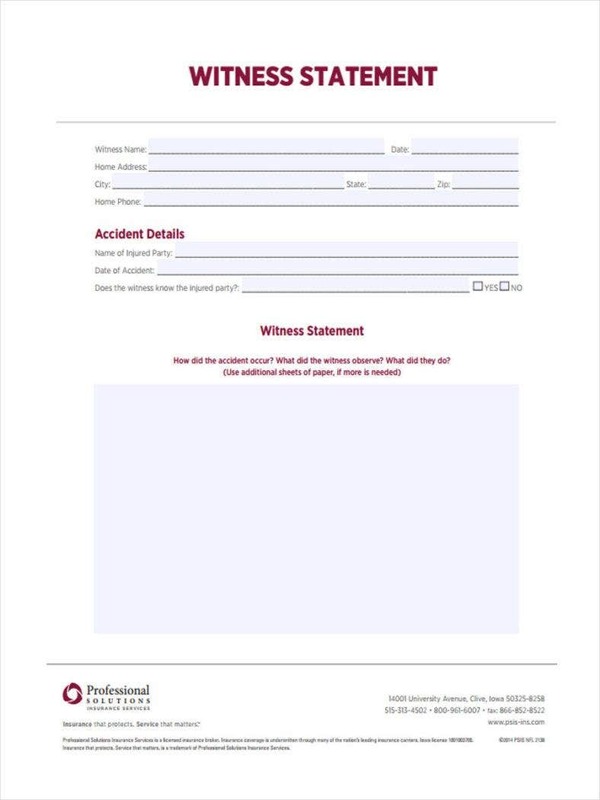 Take down all of the necessary witness statements and complete your investigation report in every case, even in the case where an injured person states that he or she lost balance and fell on his or her own. Never assume that you can hold off on an accident investigation because of any statements that were made by the injured person. Make sure to always complete your investigation report and obtain all the necessary statements for every case. During the initial questioning of the witness, it is advisable to take down notes. However, you have to make sure that your note-taking is unobtrusive and you stop should the witness feel distracted or uncomfortable. You need these notes as these can help you verify other statements that you have gathered and may just become a useful tool of evidence in court. Try to keep your questions as simple as possible. Avoid using any terminology that the witness does not know as it will be a waste of both of your times. Once you are done asking your question, let the witness do the talking. You do not want to add anything that could influence the witness, so keep silent and wait until the witness has finished saying whatever needs to be said. If the witness is having a hard time recalling things that happened during an incident, then the only thing that you have to do is to remain patient. If the witness does not have enough information to answer a particular question, then just record whatever he or she can say about it. Do not insist that the witness give a yes or no answer to every question that you ask. Allowing the witness to try and elaborate on any information is vital. Just remember to tell that person that he or she must only provide whatever he or she saw and heard, and nothing more. The witness may have some difficulty in voicing out what he or she was able to observe. In the event that this happens, you can make use of sketches or diagrams to help out. 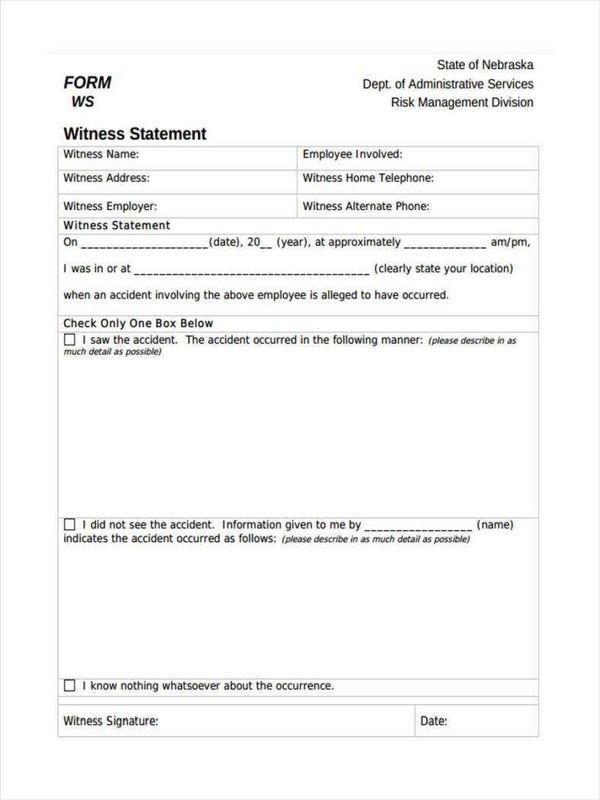 Your accident investigation report or safety survey should have a diagram of how and where the incident occurred that will help you provide a visual interpretation for the witness. Never admit to any liability. You should never make any statement to the witness that suggests that you have prior knowledge of a dangerous condition or behavior that has led to the incident. You should not argue with the witness regarding moral or legal responsibilities. Remember that anything said can and will be used against you, so try to know what you should say and what you should not during these situations. 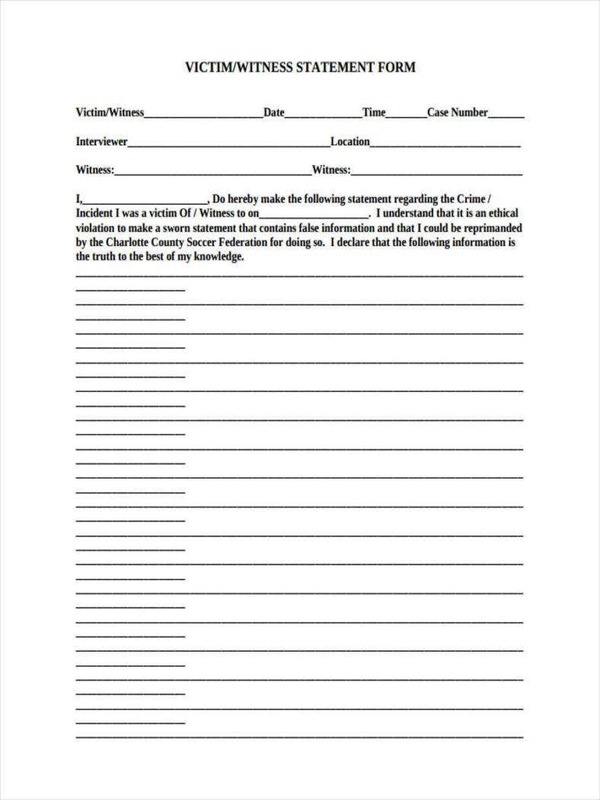 All statements in a witness statement form must be signed and dated by the person taking the statement and by the person giving the statement. Both parties must write their complete names, addresses, and contact details in the form as legibly as possible. If not, then these will not be viable for use in court. If there is more than one witness, then you are going to have to interview each of them individually instead of in a group. Group interviews will allow one witness to hear the statement of another and this can only lead to confusion or even repetitive statements. Plus, one might just be influenced to go along with another witness’ statement and this can only lead to falsified information. Making use of a tape recorder to save witness statements is acceptable in some states or countries, but the circumstances in which they can be used have to be carefully controlled. So in the event that you do make use of a tape recorder, then you need to keep these three factors in mind: a.) a written and signed witness statement is always the best form of evidence; b.) the area where you are recording the statement may be too noisy and you may not be recording good quality audio, resulting in it becoming completely useless; and c.) always remember that you may have to transcribe the statement and then supply a copy to the claimant as well as his or her attorney. 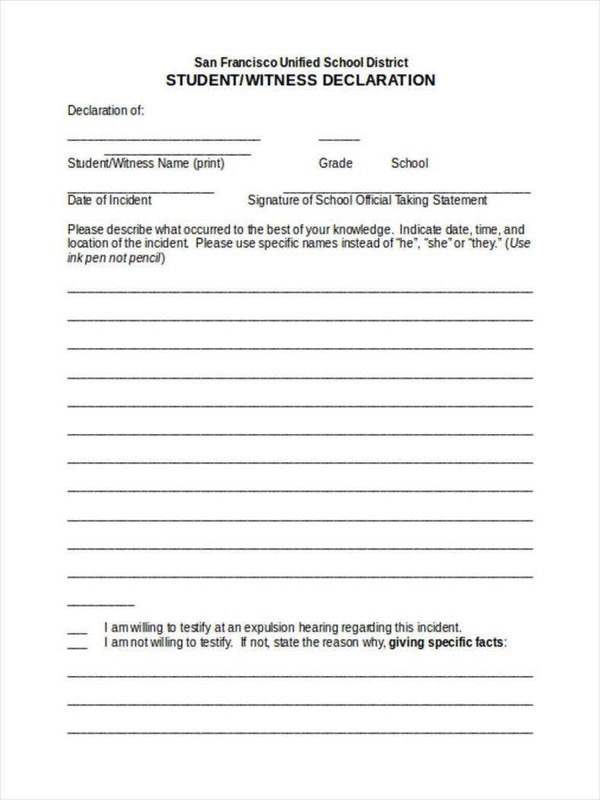 Always use a witness report form to document a statement given by a person who is a witness to any incident. 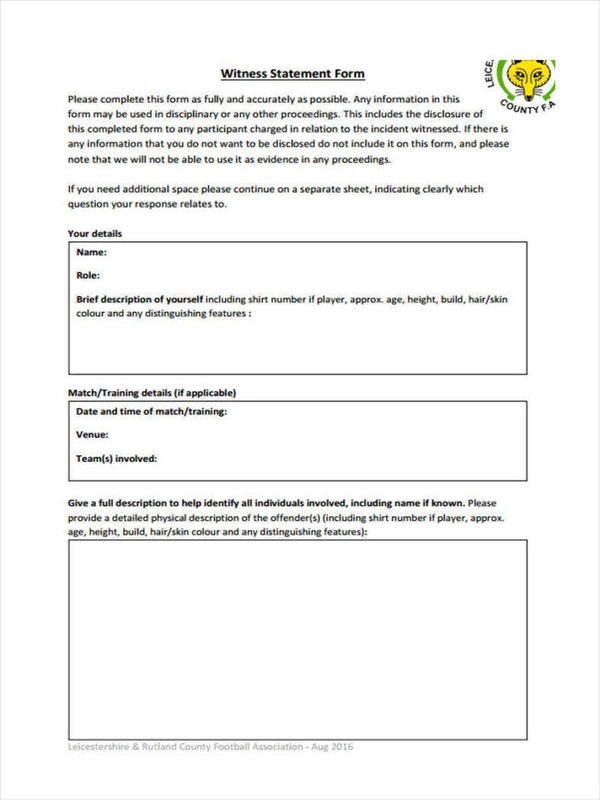 The form should contain a checklist of information to obtain and a space for the person who is taking the statement as well as the person giving the statement to affix their signatures. Before you decide to write a witness statement for the court, make sure you remember every single detail of the incident and reflect whether you or the person who is providing the statement is actually worthy to be called a witness. Remember to keep everything brief and concise. You do not want to make it too long and confusing as that will just defeat the purpose of the witness statement. 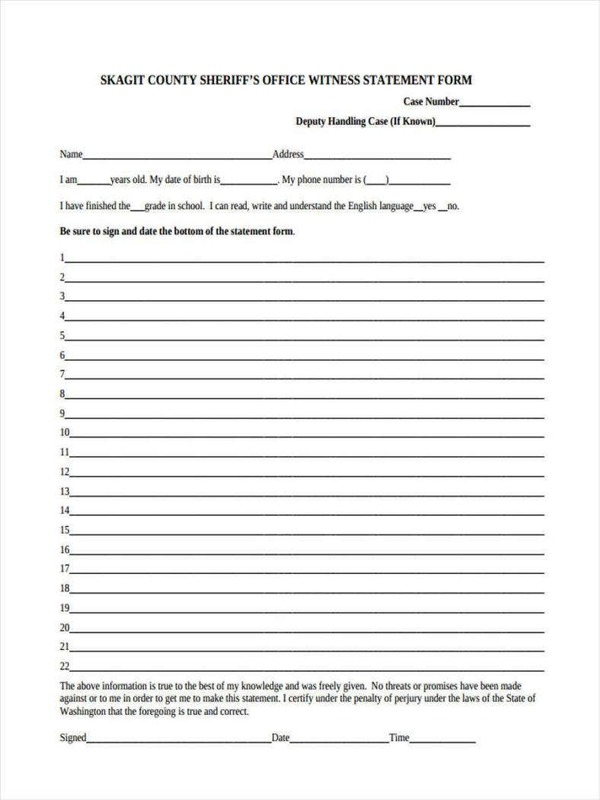 Start writing by providing the court name, the name of the case, or the case number. 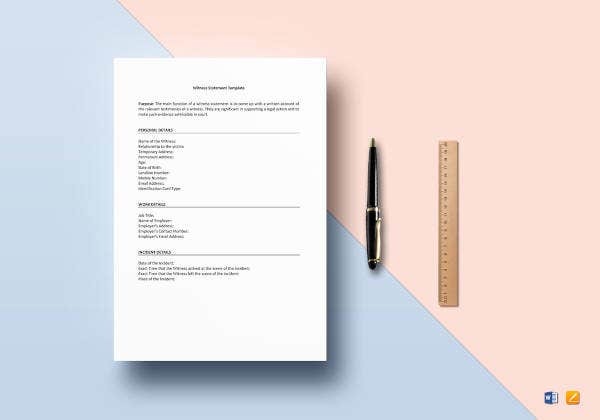 Place small numbers before every paragraph so that both the judge and the lawyers can easily go through all of the statements you have included in your witness statement form. Give a short background of the case that is going to be discussed in court. Make sure that everybody who hears about the case has a general idea of what has happened and why it is being brought up to court. You can decide to write the statements in either bullet or narrative form. Make sure that all of the statements you place in the form are true and that you provide all of the necessary evidence that is relevant to the case being discussed in court. Also, make sure that all of your statements are chronologically organized. You want the judge and the lawyers to know what happened first and what happened last. 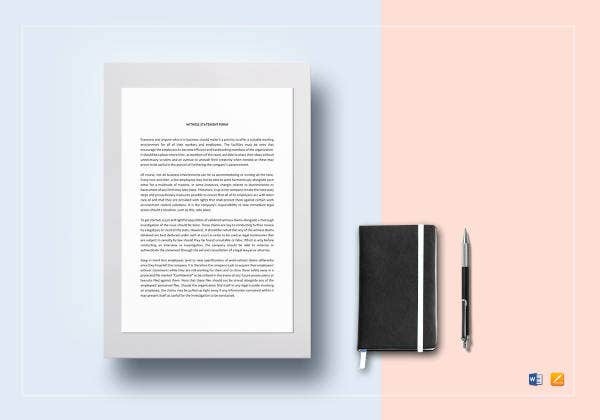 Include a statement that you have sworn to the law that all of the statements you have placed in the document are all true and that you fully understand that all of the statements can be used against the defendant. Certify your statement by affixing your signature over your printed name. If you would like to learn more about witness statements or anything related to the topic, such as how you can go about making an incident report, then go through all of our other available articles for additional helpful information.